The full version of Unknown Enemy has finally been released (a lite version is said to be in the works)! Head over to their downloads page to get your copy. 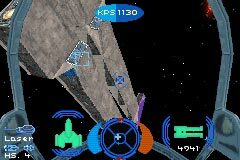 Unknown Enemy is the first total conversion for Wing Commander: Secret Ops and requires that the downloadable SO be installed. Congrats to all involved! Apparently, Casey made a boo-boo. His incorrect rank insignia is actually noticeable at points throughout the first half or so of Prophecy. The Stars My Destination Software, Inc. The official web site of Destination Software, Inc., publishers of Wing Commander Prophecy GBA is back at long last! There's a Wing Commander Prophecy section (and their flash movie has a Prophecy segment). Most interesting is the description of Prophecy: "Wing Commander Prophecy opens a new trilogy in the Wing Commander universe packing more punch than any other space combat game out there." Is it just an old description or could they be planning to continue Prophecy's story? And now, the next set of Wing Commander Prophecy Polaroids, courtesy of Adam Foshko, the Origin Museum and Cpl Hades. Well, I'd do pretty much anything for a Confed Duffel Bag... I'd even... sit through 24 days of Casey pictures! Chat Zone member Zor Prime reports that Raylight has added a new WCP GBA shot to their Blue Roses website. It's the Midway, seen from the Tigershark's cockpit. This briefing room shot is the last picture of Blair. Confed needs to contract better carpet fitters. 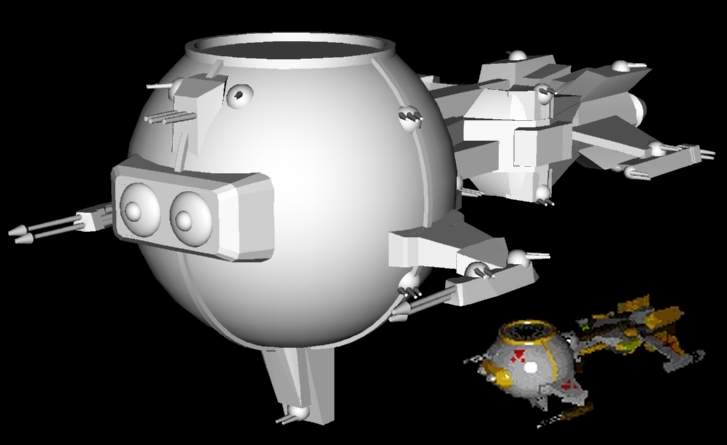 Newcommadnerondablock checks in to report that he's finished another ship for the Fleet Action mod for Homeworld! The Sivar class dreadnought, seen below, has been modeled and will be available in the next FA update! According to this post on the Unknown Enemy site, the game is now very nearly complete. The update states that they expect to release it this weekend, though the weekend is about to come to an end so perhaps some last minute fixes are taking place. Nevertheless, the wait is very nearly over! Our onslaught of Prophecy Polaroids continues! Here's an artistic shot of Blair admiring the floor. [...]it will have succeeded where other episodic titles, like Electronic Arts’ Majestic, and Origin’s Wing Commander: Secret Ops, have failed. Both games were discontinued after neither attracted significant numbers of players. Mainstream gamers bristled at both the pacing and the intrusive quality of online conspiracy game Majestic, while the large download size of each episode of Wing Commander: Secret Ops (about 120 MB) prevented the game from catching on at a time when most people used 56K modems to connect to the Internet (the game was released in 1998). Secret Ops added up 120MB with optional speech pack, but a slimmer 60MB version was available for download in 20MB segments. The full version also appeared on many cover discs, and the episodes themselves were hardly over a megabyte. Secret Ops was not discontinued: all episodes were released and the game was later bundled with Prophecy in a package called Prophecy Gold. The story for our small demo is finished in both languages (English and German) and we have started creating the first mission. Also we have found some voice actors, but we still need more. At least 2 more English and 2 more German speakers are searched! Remember the faster we find them the faster we can make the demo ^__^ The main story for the mod is nearly finished, we still need a little more time to finish it and revise it. Tolwyn and I are also working on some CGI (Computer generated images) movies for the demo and a trailer for you. Drop them a line if you'd like to do some voice acting. Alliance Productions is inaugurating a new era in it's life. We are glad to announce the creation of OpenPrivateer, our very own game engine. Building on concepts learned from the manipulation of the FreeSpace 2 engine and it's data I, Derek Meek President of Alliance Productions, decided to start my own Space Flight Combat Simulation. The game will be styled after Wing Commander Privateer, but have it's own universe. Through an easy mod selection system you will be able to create your own universes, perhaps even a OpenPrivateer implementation of the Classic Wing Commander Privateer. He has a Chat Zone thread up here with development details. Chat Zone regular Talyn 83 sends word that BBC2 is airing the Wing Commander movie next Friday (October 11) at 0:15am UK time (11:15pm GMT). Also we have now a status bar, and as you can see there we have finished the Music part for the game. The model also come along very well. Many ships are playable at the moment and only need some fine tuning. Also are we working on new screens for the menu and other things. Coms are also ripped from WC and ready for the mod. Jump Animation has been changend and is now that from WC3/4, also has the Shieldhit ani been changed and Capships now have shields also. In the Forum are also some pic of the Kilrathi DN in full size as it was never seen in Wing Commander! They're also looking for English and German voice actors. Details here.